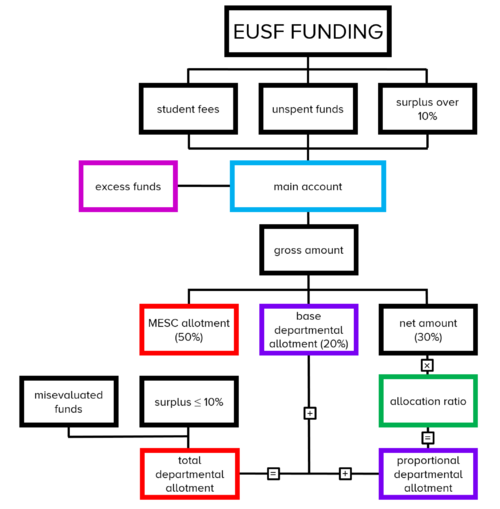 The Engineering Undergraduate Support Fund Bylaws go over the approval process, requirements, distributions, and more of the EUSF. 1.1 The Engineering Undergraduate Society of McGill University (hereafter “EUS”) is the registered name of the not-for-profit corporation representing the engineering and architecture undergraduate students at McGill University. 1.2 The Board of Governors of the EUS (“Board of Governors”) is the administrative board of the Engineering Undergraduate Society of McGill University which is composed of Administrators as defined by the EUS Constitution. 1.3 The EUS shall recognise all Departmental Societies, Clubs, and Design Teams set forth in the relevant articles of the EUS Constitution as EUS Groups. 1.4 The Engineering Undergraduate Support Fund (“Support Fund” or “EUSF”) is an emergency fund composed of fees paid by engineering undergraduate students, whose purpose is to provide those students with additional human resources to those normally supplied by the University, including: teaching assistant hours, lab technician hours, and funding for staff from the McGill Engineering Student Centre (“MESC”) and departmental offices. 1.5 The Support Fund Committee (“SFC”) is an EUS committee which normally administers the Support Fund. 1.6 These bylaws govern both the Engineering Undergraduate Support Fund and the Support Fund Committee. 2.1 The Support Fund Committee shall coordinate the expenditure of the Engineering Undergraduate Support Fund monies in such a manner that it most benefits the Engineering Undergraduate Society’s members in their academic environment and professional development. 2.2 The Support Fund Committee shall determine a list of proposals for support acquisition in the manner outlined in article 8. 3.1.1 The opening of the application period by the Vice President Academic of the EUS shall occur twice, once in the Fall semester and once in the Winter semester. 3.1.1.1 Opening the application period shall consist of the Vice President Academic of the EUS releasing the Support Fund application form as well as the predicted departmental and Faculty allotments as per 10.4. 3.1.2 The deadlines for the opening of the application period shall be the third Monday in the month of October for the Fall allocation, and the first Monday in the month of March for the Winter allocation. 3.1.3 The deadlines for the submission of applications shall be the second Monday in the month of November for the Fall allocation, and the fourth Monday in the month of March for the Winter allocation. 3.1.4 The latest possible date for the SFC to meet and vote on proposals submitted in the Fall shall be the first Monday in the month of December, and the third Monday in the month of April for proposals submitted in the Winter. 3.1.5 Monies allotted in the Fall semester must be spent in the following Winter semester. 3.1.6 Monies allotted in the Winter semester must be spent in the following Summer or Fall semester(s). 4.1.1 Meet with the Chairperson of their department, or their appointed representative, to review proposals. 4.1.2 Complete a preliminary budget to be signed by themselves and the Chairperson following their meeting as per 4.1.1. 4.1.3 Submit their department’s applications and preliminary budget to the Vice President Academic of the EUS for review. 4.1.4 Provide their council with a list of the department’s expenditures in the prior year as they pertain to the EUSF. 4.1.5 Amend the proposed budget as per 4.1.2 to reflect the results of their council’s vote on the proposals. 4.1.6 Send the finalized budget to the Vice President Academic of the EUS directly following the application submission deadline(s) as per 3.1.2. 4.2.1 Organize a vote by their councils on the proposals. 4.2.2 Sign the finalized proposal budget. 4.2.3 Complete the duties outlined in 4.1 in the absence of the departmental Vice President Academic. 4.3 Departmental councils shall review and vote on the proposals suggested by the departmental Vice President Academic. 4.3.1 A two-thirds (2/3) majority shall be necessary for proposals to proceed to the EFC. 5.2.5 Two (2) members-at-large appointed by the EUS Council. 5.2.5.1 The two selected members should be from different departments. 6.1.1 Propose motions to the EUS Council and Board of Governors seeking committee members. 6.1.2 Chair the SFC meetings. 6.1.3 Set and distribute the agenda for the SFC meetings, and inform all members as to the dates and times for these meetings at least five (5) school days in advance. 6.1.4 Coordinate all actions taken between meetings, and, when relevant, keep all members informed as to these actions. 6.1.5 Advise and instruct all members to ensure that they are able to perform their duties, and enable the SFC to be as effective as possible. 6.1.6 Oversee the financial management of the Support Fund Accounts. 6.1.7 Verify the requisitions made as a result of approved EFC proposals. 6.1.8 Following the SFC meeting, the Vice President Academic of the EUS shall communicate the approved proposals and finalized EFC budget to the Faculty financial services team. 6.1.9 Verify that the previous term’s approved proposals have been fulfilled . 6.1.10 Take action in the event that the funds allocated in any previous year are not used for its intended purpose. 6.1.11 Present to the first regular EUS Council meeting of each November a description of the previous year’s expenditures in the Support Fund accounts. 6.2.1 Take minutes of the SFC meetings. 6.3.1 Review all submitted proposals prior to the SFC meeting. 7.1.1 The Dean shall appoint a replacement faculty representative. 7.1.2 The EUS Executive Committee shall appoint one of its members as a replacement for the Vice President Academic of the EUS. 7.1.3 The EUS Executive Committee shall appoint one of its members as replacement for the President of the EUS. 7.1.4 The Board of Governors shall appoint one of its members as a replacement for a Member-at-Large of the Board of Governors. 7.1.5 The Vice President Academic of the EUS shall appoint a replacement for a member-at-large. 8.1 Each member as defined by 5.2 shall have one vote on the SFC. 8.2 Quorum shall consist of eight (8) members of the SFC, provided the Dean, or their replacement as per 7.1.1, and the Vice President Academic of the EUS, or their replacement as per 7.1.2, are in attendance. 8.3 Proposals from a department may only be voted on if that department’s chairperson and departmental Vice President Academic, or their respective representative(s), are present. 8.4 Proposals from MESC may only be voted on if a representative from MESC (“MESC Representative”) is present. 8.5 A two-thirds (2/3) majority is required for a departmental proposal to pass, otherwise the proposal is rejected for the current year. 8.6 A two-thirds (2/3) majority plus the Dean is required for a MESC proposal to pass, otherwise the proposal is rejected for the current year. 8.7 Proposals dismissed in 8.4 and 8.5 may be submitted again, with or without modifications, in subsequent years. 8.8.1 An email shall be sent to the committee members by the Vice President Academic of the EUS detailing the circumstances of the vote, and shall include the proposals being reviewed. 8.8.2 A deadline shall be set and the vote shall be considered complete after this period of time has elapsed. 8.8.3 If quorum has not been reached, the deadline shall be extended until eight (8) members of the EFC have submitted their votes. 8.8.4 All proposals under consideration through this online approval process are subject to the voting requirements per 8.2. 9.1 The department’s Vice President Academic shall present a report to the SFC at the end of the semester, detailing how every departmental proposal was spent. 9.1.1 Professors whose courses have benefitted from EUSF Funding should obtain feedback from their students, through a course evaluation or some other anonymous polling method, which shall be shared with the departmental and EUS Vice Presidents Academic. 9.2 The MESC Representative shall present a report to the SFC at the end of each semester detailing how every MESC proposal was spent, and a quality report with testimonials from students who benefited from services received as a result of the Support Fund. 10.1 The Support Fund shall be composed of two (2) distinct accounts: one account shall receive all monies collected from students and shall serve to make purchases (“main account”), and another account shall receive all other contributions to the Support Fund (“contribution account”). 10.2.1 Every student registered in an Undergraduate Engineering program and taking nine (9) credits or more (“full-time students”) shall contribute thirty-five dollars ($35) per semester to the Engineering Undergraduate Support Fund. 10.2.2 Every student registered in an Undergraduate Engineering program and taking less than nine (9) credits (“part-time students”) shall contribute per semester one half of the amount stipulated in 10.2.1 to the Engineering Undergraduate Support Fund. 10.2.3 The fees per 10.2.1 and 10.2.2. shall be collected by McGill University as as a mandatory student fee, and deposited into the main account of the Support Fund. 10.2.4 Any contributions other than those per 10.2.1 and 10.2.2 shall be collected by University Advancement and deposited in the contribution account of the Support Fund. 10.2.5 Transfers from the contribution account to the main account shall be initiated by the Vice President Academic of the EUS whenever necessary, provided that the transfer is ratified by the Board of Governors. 10.3 For a given year, the gross amount available for allocation (“gross amount”) shall consist of the sum of the collected fees as per 10.2.1 and 10.2.2, of the funds transferred from the contribution account, if any, and of the monies not spent in the previous year(s) that were returned to the main account. 10.3.1 Monies in the main account that exceed the gross amount shall be considered excess funds. 10.3.2 In the event that the total value of excess funds shall reach or exceed fifty thousand dollars ($50,000), they shall be allocated for Support Fund proposals from the EUS, its groups, and other members of the Faculty of Engineering. 10.3.3 Proposals to the excess funds shall be managed by the Vice President Academic of the EUS and ratified by the Board of Governors. 10.4.1 Fifty percent (50%) shall be allotted only for MESC proposals (“MESC allotment”). 10.4.2 Twenty percent (20%) shall be evenly divided between the departments defined in 5.1 (“base departmental allotment”). 10.4.3.1 The allocation ratio for each department shall correspond to the fraction of the total number of students in that department over the total number of students in the Faculty of Engineering. 10.4.3.2 The total number of students shall be calculated as the sum of part-time students, divided by two, and all full-time students in a given department or the Faculty. 10.4.3.3 The allocation ratio times the net amount shall be the proportional departmental allotment for each department. 10.4.4 The total allotment for a department shall consist of the sum of the base departmental allotment of 10.4.2, the variable allotment of 10.4.3, and any surplus or misevaluated funds from the previous year. 10.5 The MESC allotment shall be used for purchases which benefit students from all departments. 10.6 The MESC allotment may not be used to pay for departmental purchases that have gone or will go over their allotted budget. 10.7 If a department agrees to allocate money from its own accounts toward a Support Fund proposal, then a letter covering the agreement and signed by that department’s Chairperson must be presented to the SFC before a vote on that proposal can be initiated. 10.8 If the Faculty of Engineering agrees to allocate money from its own accounts toward a MESC proposal, then a letter covering the agreement and signed by the Dean must be presented to the SFC, before a vote on that proposal can be initiated. 10.9 In the event that a partially funded purchase can no longer be bought due to budget cuts on the side of MESC or a department, the monies set aside by the Support Fund shall be returned to the main account in full. 10.10.1 Surplus Funds are defined as the amount of money awarded to a department for which no proposals are submitted. 10.10.2 Unspent Funds are defined as funds that arise when approved proposals have not been completed by the deadline set in 3.1.4. 10.10.3 Misevaluated Funds are defined as funds that arise when an item costs less than the amount approved by the SFC. 10.11 Surplus Funds less than or equal to ten percent (10%) shall be added to the following term’s allotment for that department as calculated in 10.4.4. Any of the surplus above ten percent (10%) shall be returned to the following term’s main account as per 10.3. 10.12 Unspent funds as defined by 10.11.3 shall be returned to the main account in the term following the deadline to spend the allotted funds. 10.13 Misevaluated funds as defined by 10.11.4 shall be awarded to the department from which the funds arise in the term following the misevaluation. 10.14 In the event that the cost of an approved proposal increases by ten percent (10%) or less, the purchase may be made with no additional approval. Should the increase exceed ten percent (10%), an online approval process shall be completed as per 8.8. 11.1 In any course that has hired personnel as a result of the Support Fund, an acknowledgement to the Support Fund should be presented on the course syllabus. 11.2 Any EUS Group or member of the Faculty of Engineering having received financial support from EUSF that cannot be reflected on a syllabus should make an announcement or otherwise acknowledge this source of funding. 12.1 The Support Fund shall terminate after two (2) years. 12.2 A general referendum must be passed to extend the Support Fund fees past the two (2) years of its planned existence. 12.3.1 The SFC shall be rendered obsolete and dismissed. 12.3.2 Any allocations that were approved by the SFC prior to the dismissal of the Support Fund fees shall be honoured. 12.3.3 Any allocations from the excess funds that were approved by the Board of Governors prior to the dismissal of the Support Fund fees shall be honoured. 12.3.4 Any outstanding fees that were assessed prior to the dismissal of the Support Fund fees shall be deposited into the main account of the Support Fund. 12.3.5 Notwithstanding 10.2.1 and 10.2.2, the clause outlined in 10.2.4 shall remain in full effect. 12.3.6 Notwithstanding 10.6, 10.7, and 10.8 and its subsections, any surplus shall be returned to the main account of the Support Fund. 12.3.7 The administration of the Support Fund shall be transferred to the trust of the Board of Governors. 12.3.8 The Board of Governors shall administer the Support Fund in agreement with 2.1. 12.4 A general referendum must be passed to reinstate the Support Fund fees in the case that the Support Fund fees had previously been suspended, as per 12.2. 12.5.1 The trusteeship defined in 12.3.7 shall be rendered obsolete and terminated. 12.5.2 The SFC shall be reinstated. 12.5.3 Any proposals that were ratified by the Board of Governors prior to the reinstatement of the Support Fund fees shall be honoured. 13.1 This document completely supersedes any anterior versions of the Support Fund Bylaws. 14.1 Amendments to these Bylaws must be approved by a simple majority vote of the Board of Governors of the EUS. 14.2 Amendments to these Bylaws must additionally be ratified by a general referendum. This page was last edited on 13 October 2018, at 06:48.